1. Each team must field 3 players to compete; there is no limit to the number of substitutions/bench players. 1. Playing Area: Half-court of a regulation basketball court. 2. Game Length: 12-minute games followed by 3 minutes for free throws. The main score clock will be used for timing; games start and end by that clock alone, regardless of when your court actually begins playing. 3. Possession at the start of the game will be decided by coin toss. 4. Regular basketball scoring will apply: 3 points beyond the 3-point line, 2 within. a) Following each basket, the ball will be checked at the top of the 3 point line with the team just scored upon in possession. c) One-Pass Rule: The offence must make at least one pass after a ball is checked before attempting to score; if a team violates this rule and scores, the basket will not count, and the defensive team will be awarded possession. 3. No 'Jump Balls' - defense is awarded possession. 4. Substitutions: Substitutes may enter at any stoppage of play before the ball is checked. a) Participants shall call their own fouls with the offence's opinion taking precedence. The fouled team is awarded possession. b) Free throws are cumulative and upon completion of the game, will be shot by one player designated by each team. Each free throw is worth 1 point. c) Shooting Fouls: the fouled team will be awarded 1 free throw and possession of the ball. If a shooting foul occurs on a made field goal, the basket will count in addition to the 1 free throw and possession of the ball. d) If a team accumulates 10 team fouls or more, each foul will award the opposite team 1 free throw and possession of the ball (offensive fouls do not count as team fouls). 6. Scorekeepers will act as impartial observers to the nature of the activity and will convey information to the GDS if there is any questionable sportsmanship. 7. Any disputes that cannot be resolved by the teams involved will result in losses for both teams and possible further disciplinary action. 8. Both captains must confirm scores and sign the game sheet following each game! Non-shooting Foul - a foul committed when a player has not attempted to shoot the ball. 1. Each team must field 4 players to compete, with a minimum of 2 females; there is no limit to the number of substitutions/bench players. 3. Possession at start of game will be decided by coin toss. 1. Each team must field 5 players to compete, with a minimum of 2 females; there is no limit to the number of substitutions/bench players. a) Teams short players may ask the opposition to allow the game to proceed. 1. Game Length: games shall be 2 x 20 minute running time halves. a) The last two minutes of play will be stop-time if a 5 points-or-less differential exists. 2. Half-Time Break: 3 minutes in duration. 1. Fouls: Team fouls are non-cumulative between halves; personal fouls will not be counted. b) Double bonus (two shots) granted upon the 10th team foul. 2. Technical Fouls: Unsporting behaviour directed at any participants or staff will be assessed a Technical Foul. Two technical fouls results in ejection from the game. 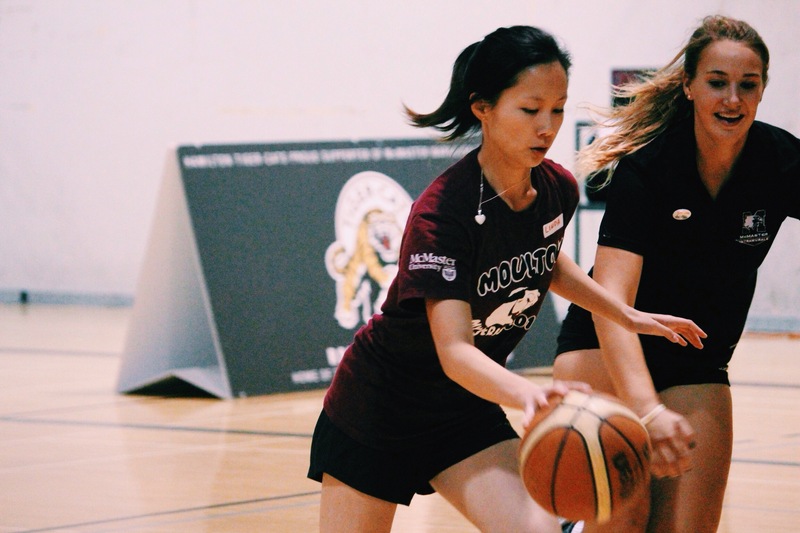 a) Misconduct: As per the Code of Conduct, any individual or team who fights and/or directs abuse (verbal or physical) towards officials, intramural employees, university staff, and/or fellow participants during an intramural contest or, in related pre and post game activities is immediately banned indefinitely from all intramural competition. 3. Time-Outs: Each team is allowed one twenty second time out (game clock stopped) per half. Time-outs are non-cumulative across halves. 4. Injuries: When an injury occurs to a player the referee uses his/her discretion in stopping the play. However, if the injury is obviously of a serious nature, the referee has been instructed to blow the play dead immediately. The injured player is not to resume play under any circumstances until proper medical attention has been received. 1. Each team must field 5 players to compete; there is no limit to the number of substitutions/bench players. 2. Half Time Break: 3 minutes in duration.